History is a never-ending chain of events, trends, and discoveries that determine how we think and look at the present, and often the future. When history tells us something cannot be accomplished, it provides us with new and seemingly unreachable targets at which to aim. And if and when that target is hit, it provides a sense of timelessness and perpetuity. Some call it immortality. When American Pharoah went to the post for the 2015 Belmont Stakes, a new link to the Triple Crown chain had not been added in 37 years. Those who experienced the 16 failed attempts since Affirmed in 1978 had to feel as if that chain had rusted beyond all hope. Whether it was due to injuries, freakish incidents, or heartbreaking defeats, racing’s prestigious triad appeared to be unattainable. Names like Citation, Whirlaway, Count Fleet, War Admiral, and Gallant Fox were drifting further and further into the past. Even the three Triple Crown winners of the glorious seventies were now merely names to those in their 40s. And so when American Pharoah coasted home unchallenged, the hallowed halls of Belmont Park rocked as they had never rocked before. That elusive link had finally been added and for the first time in nearly four decades racing fans had witnessed and been part of history. Immediately came the revelation: yes, it can be done…if you wait long enough and persevere through all the anguish. Surely nothing could top that or even equal it. And surely, if the Triple Crown were to be swept again in the near future it would not be the same, with the light of American Pharoah still shining brightly in people’s minds and hearts. But then three years later, along came a towering muscular Adonis of a horse named Justify. Out of the same barn that spawned American Pharoah, Justify appeared on the Kentucky Derby scene seemingly out of nowhere. One minute trainer Bob Baffert was cruising along with three Derby hopefuls--McKinzie, Solomini, and Mourinho--and then a puff of smoke appeared Feb. 18 and there was Justify as if emerging from Aladdin’s lamp. Could this be the next Arrogate or West Coast--late-developing 3-year-olds who would become major stars after the Triple Crown, destined for races like the Haskell Invitational or Travers Stakes? No, said Baffert. This was his Kentucky Derby horse. In fact, when he was granted his three wishes, he again asked for victories in the Kentucky Derby, Preakness, and Belmont Stakes. Baffert had made history three years earlier with American Pharoah, but even he had to know that this had never been done before. This was like an extraordinary teenage athlete going into the NFL having never even played high school football. There was no foundation. We were already well into the Derby trail with established stars such as Good Magic, Bolt d’Oro, Audible, McKinzie, and others. But Baffert knows how to identify a diamond in the rough before they become dazzling gems as well as anyone and he knew he had something special in Justify. When Baffert ran into my colleague Lenny Shulman at Santa Anita one morning, he asked him, “Do you want to come see the Kentucky Derby winner?” Only a very special horse can inspire that kind of confidence. And so Baffert launched his latest rocket Feb. 18 and now here we were June 9 back again at Belmont Park staring history in the face. This time, however, it was different. When American Pharoah swept the Triple Crown, racing fans were hopeful they were about to witness history, but so many years of failure left that one shred of doubt the feat could be accomplished. The glorious seventies were long gone and the racing gods were not as kind to the horses of the 1990s and this century. Yes, the fans were confident, as they were with Big Brown and Smarty Jones and California Chrome and Silver Charm and some of the others on the verge of greatness that came up short over the sprawling Belmont oval. So, when American Pharoah strode in solitary splendor down the Belmont stretch, the place erupted in unrestrained jubilation, as if some ominous cloud had finally been lifted. Now, three years later, they were back again; 90,000 enthusiastic fans cramming into Belmont Park. But now they knew the once elusive Triple Crown could be conquered. The trainer was the same, the co-owner had already won two Belmonts, and there is no rider you would want on a horse in a big-money race who could handle the pressure more than Mike Smith. In 2015, racing fans, and sports fans in general, craved a Triple Crown winner; to know the feeling of what it was like. So many times it was within their grasp. It was inches away at the quarter pole. They could all but touch it at the eighth pole. But each time it slipped away. When American Pharoah finally did it, there was almost a sense of disbelief. This year, however, they knew the feeling and wanted badly to savor it again; to recapture that glorious moment of celebration and the hugging and kissing and cheering wildly like they had never cheered before. This no longer was a moment to envision, it was fully embedded in the psyche. The doubts were gone. They knew what it would be like if Justify won. This time the Triple Crown gremlins were gone. You could feel the excitement build throughout the day. Yes, there were some skeptics who felt Justify was tailing off after his narrow victory in the Preakness Stakes, in which his speed figures declined. But most realized he had exited the Kentucky Derby with a foot bruise, had virtually no serious training between races, and was forced to go eyeball to eyeball most of the way with last year’s Juvenile Male champion and Breeders’ Cup Juvenile (G1) winner Good Magic. And he still won. The speed figures clouded the enormity of that victory, but Justify’s career has not been about numbers; it has been about winning. The majority of the fans believed, as did Baffert, that this was no ordinary horse, and they embraced the fact that his meteoric rise defied all logic. Horses, especially those with no racing foundation, are not supposed to be subjected to such a grueling schedule and get stronger after each race. While the 12 previous Triple Crown winners all added new chapters to the annals of the sport, Justify rewrote the history books by venturing into uncharted territory and accomplishing feats not even the all-time greats could come close to. So, once again the grandstand shook. Once again the deafening cheers reverberated throughout Belmont Park. The script that Justify has been writing since he burst on the scene in mid-February kept reaching new heights of implausibility. He had become the first horse in 136 years to win the Kentucky Derby without having raced as a 2-year-old. He had become the second horse in 103 years to win the Derby with only three career starts, and one of only three horses to do it in the 144-year history of the race. He became only the second undefeated horse in history to sweep the Triple Crown. He ran the fastest winning fractions in the history of the Kentucky Derby. To put things in proper perspective, it is important to note that Sir Barton captured the Triple Crown 11 months after his career debut; Gallant Fox 11 1/2 months; Omaha 11 1 1/2 months; War Admiral 13 1/2 months; Whirlaway 12 months; Count Fleet 12 months; Assault 12 months; Citation 13 1/2 months; Secretariat 11 months; Seattle Slew 8 1/2 months; Affirmed 12 1/2 months; and American Pharoah 10 months. That is an average of almost 11 months between their career debut and the Belmont Stakes. Justify completed his sweep of the Triple Crown just 16 weeks, or 111 days, after his career debut. For a horse to cram six races, four grade 1 victories, and a sweep of the Triple Crown in such a short period of time is unimaginable. Horses just don’t do that. And he did it racing on three fast tracks, two sloppy tracks, and one muddy track, while winning his six races at six different distances from seven furlongs to a mile-and-a-half. In short, we are witnessing something we have never seen before. Imagine the mind and the physical prowess it must take to accomplish such a feat. To use a standard cliché, we must be dealing with a freak of nature. Justify has remodeled the blueprint of a Triple Crown winner, and has eradicated all historical trends, making them irrelevant. One must remember how much more difficult it is now to sweep the Triple Crown. When Sir Barton became the first horse to win the Kentucky Derby, Preakness, and Belmont the foal crop was 1,665. When Gallant Fox won, it was 5,137. When Citation won, it was up to 8,434. When Affirmed won, it was 32,114, but anyone during the 1970s, including claimers and allowance horses, could run in the Derby and often did. Although the foal crop is down to about 23,000, horses must qualify to run in the Kentucky Derby, with 20 horses each year boasting victories or placings in grade 1 or grade 2 stakes. And more and more top-class fresh horses now show up in the Belmont. Looking at the previous 12 Triple Crown winners, they faced an average of 4.6 opponents in the Belmont Stakes, with Count Fleet, Whirlaway, Omaha, Gallant Fox, and Sir Barton facing either two or three opponents, and Secretariat and Affirmed facing four opponents. None of the Triple Crown winners had faced more than seven opponents. Justify faced nine opponents, four of whom had won or placed in grade 1 stakes; two had won a grade 2 stakes; one had won a grade 3 stakes; one had placed in a grade 2 stakes; and one had won four straight races in England. When Justify made his career debut, his Belmont Stakes opponents had already made a combined total of 35 starts and won or placed in nine stakes. So there is no doubt we are dealing with something extraordinary; something we have never seen before, and likely will never see again. Forget speed figures and huge margins of victory. Justify is all about winning and doing so in a remarkably short period of time. It is as if Baffert pressed the ‘on’ switch and the battery has never lost power. We have already chronicled Justify’s early days through the eyes of his breeders, John Gunther and his daughter Tanya. But when it comes to the majority owners WinStar Farm and China Horse Club, there are no Cinderella stories when they win a big race. WinStar has been built into a powerhouse operation by owner Kenny Troutt and president, CEO, and racing manager Elliott Walden, and now possesses more of a corporate image; a factory-like operation, with an abundance of stallions and broodmares and seemingly unlimited resources at the sales. And they churn out major stakes winners year after year. But behind that corporate image lies the backbone of WinStar--the people from all walks of life whose passion for the sport and love of the horse help make the operation the success it is. Their cheers are as loud as anyone’s; their butterflies before a race jump around as much as anyone’s; their pride in the horses who come off the farm is as strong as any owner’s or trainer’s. Talk to the farm’s assistant trainer Destin Heath or training barn foreman Salbador Ceballos or marketing coordinator Bethany Wurl and they will tell you of the day a young Justify, who the farm purchased out of the Keeneland September yearling sale, worked on the uphill half-mile straightaway dirt track. Heath added, “When he worked up the hill, I asked how fast he went and everyone said ‘You don’t want to know.’ But we knew. We watched him go every day and you know when one is that much keener than the others. He definitely showed a lot of talent from day one. It was a lot of fun watching him. Whether it was on the (Polytrack) flat track or up the hill, he handled everything. We sent him to Keeneland early on because he was such a big horse, we wanted to get him on a bigger track to give him that experience. He really reveled on those bigger turns at Keeneland when Rudy (trainer Rodolphe Brisset) had him there. Diana Elam, the front office coordinator, had a timer behind her desk showing the number of hours, minutes, and seconds to the Belmont Stakes. “That’s my countdown clock for the Belmont,” she said as she prepared for her 12-hour drive to Belmont Park. “I’m already starting to get nervous, but everyone here is very confident he’s going to do it. Elam also recalled the excitement of being at the Kentucky Derby with a large group of WinStar employees. “This is the first year they got us tickets to the Derby and be able to bring a guest,” she said. “So it brought us all closer together to have our significant others with us. We all felt if he broke well, he was going to win. And when he broke well we all started moving down the steps. There was one person who knew how to get down to the winner’s circle, Sean Tugel (director of bloodstock services and assistant racing manager). He said, ‘Just follow me,’ and we started pushing through the crowd. I made it across the mud, but as soon as we got to the fringes of the winner’s circle they said no more people. If you want to see excitement, watch the video taken by Hallie Hardy, head of client relations, of the employees watching the Preakness Stakes on TV in the office and going wild when Justify held on to win after eyeballing Good Magic for most of the race. Michael Holmes from the accounting department has a personal interest in Justify’s success, as John Gunther is a close family friend who bred 2-year-old champion Stevie Wonderboy with Holmes’ father, Tony. Gerry Davis, the maintenance manager, said he remembers Justify having a little setback, but Richard Budge saying this was one of the best ones on the farm. 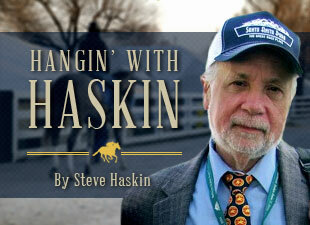 “At Winstar, we’re fortunate enough to hear that a lot. Lots of different horses come through the training barn, so I kind of shrugged it off. Elliott and I work out three or four days a week and I remember him telling me, ‘We got a horse running for Baffert in a couple of days you might want to watch. Baffert is really high on him.’ So I happened to be talking to Richard the next day and I said we have a horse running tomorrow named Justify. What do you know about him? He said, ‘Remember that horse we were talking about last fall that had a little setback? That was Justify.’ When I watched his first race on TV what caught my eye was he was about six inches taller and six inches wider than the others when they loaded him in the gate.I said. ‘Wow that is a huge horse.’ You could see in those first couple of races he had something special. With the Belmont getting closer, Heath was trying to envision the perfect scenario. “If I could draw up a paceless race like Pharoah had I’d be doing back flips,” he said. “I would absolutely love it. And barring a few things, I think it could develop like that. Pace makes the race and I think it would be foolish to try to take him off of it. Somebody would have to be suicidal to run with him. I feel extremely blessed. This is the third Derby winner I’ve had in my barn, but the first before he won. I had Mine That Bird when I worked for (Wayne) Lukas and we had Always Dreaming when he was here last year. So it’s nice to have one beforehand, who was actually my pick of the crop last year. Even for WinStar intern Mary Cage, Justify's Belmont win was one of the most memorable days of her life. "I've been a racing fan since Smarty Jones' failed bid for the Triple Crown when I was 8," she said. "As the years passed, I never thought I'd see a Triple Crown winner in my lifetime, so I resorted to watching replays of the winners before me. I cried when American Pharoah won. "Last year I got the chance to intern for WinStar and the people here quickly became like family to me. To see Justify join racing immortality for these people is an indescribable feeling. They deserve it. To be able to be a small part of it is just icing on the cake. I'm so thrilled for the joy Justify has given to every single person on this farm." So, when you think of Justify being owned in part by WinStar Farm, forget the corporate image. Just remember the people behind the scenes whose passion fuels the operation. Justify has conquered so many new worlds despite navigating his way through uncharted waters it is nearly impossible to predict what exploits lie ahead. We have no idea where this colt’s bottom is or even if he has one. He is the proverbial snowball rolling down the mountain getting larger as he goes. Justify keeps doing things that have never been done and proving with every race that nothing is impossible.